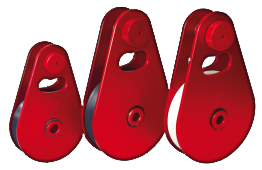 Al model pulleys are distinctive for their lightweight yet of an extremely sturdy design. Suitable to use with wire and nylon ropes. The system allows easy and quick positioning of the rope. The side plates are made from a special aluminium alloy with excellent corrosion resistance. Polyamide pulley wheels are fitted with sealed roller bearings. *Pulley AL-170 has a aluminium wheel.